Syria once was a land of unhindered Christian churches just like Iraq prior to outside meddling. However, the Christian faith now in Syria is facing the Gulf petrodollar abyss that is being assisted by NATO Turkey. Despite this, and in the full knowledge that Christianity is illegal in Saudi Arabia, President Hollande of France once more decided to turn everything upside down. 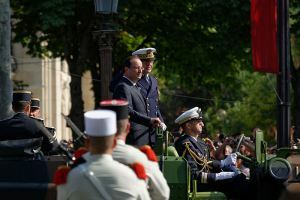 Therefore, Hollande, who is on the alleged side of democracy based on terrorism and sectarianism by stealth in Syria, is now lauding the unity of France with the most despotic Gulf monarchies in the world. The mirror of despotic Saudi Arabia is being replicated in Syria. After all, various Takfiri terrorist groups are crushing Christianity in Syria therefore this faith faces being eradicated and made illegal just like in Saudi Arabia. Of course, Hollande knows full well what is happening to the Christian minority in Iraq and Syria. Similarly, the leader of France knows that ISIS (Islamic State – IS) is beheading Christians for video campaigns in Libya, despite the promise of democracy by France, America and the United Kingdom in post-Gaddafi Libya. Equally alarming, Hollande who is hyping the Iran threat in order to obtain much needed Gulf petrodollars, fully understands that recent terrorist attacks in France belongs to the forces of Sunni Islamist militancy. Therefore, the leader of France knows that the internal threat is being inspired by the Salafi year zero Gulf version of Islam. Given this, then why is Hollande sleepwalking into the internal and external threat against secularism that is being eulogized by many in nations like Qatar and Saudi Arabia? The Shia Houthis are at a loss to why America, France, and the United Kingdom, are selling their collective souls by supporting the Saudi Arabia led coalition against this religious community in Yemen. Similarly, in Syria the religious mosaic is being threatened by powerful NATO powers that have sided with feudal Gulf monarchies in the destabilization of this nation. This reality means that religious minorities in Syria including the Alawites, Christians, the Shia, and the Druze, all face the same reality of what is happening in Iraq. Indeed, it is notable that while the Sunni dominated Saudi Arabia led coalition can bombard the Shia Houthis in Yemen daily; the same Saudi Arabia doesn’t care much about al-Qaeda affiliates and ISIS in Iraq and Syria. Of course, this isn’t surprising because various sectarian and Takfiri terrorist groups are being propped up in Syria with NATO Turkey being the open conduit for international jihadists alongside Gulf petrodollars. Hollande, not too concerned by the Sunni Islamist Takfiri threat at home based on his open arms to feudal nations that fuel Salafi indoctrination, is now showing his true colors by siding with Gulf feudal states against the Shia Houthis in Yemen. Indeed, while the UN (United Nations) is increasingly becoming disillusioned by the Saudi led bombing of Yemen, the government of France merely seeks to make more military sales to feudal Gulf powers. This shocking behavior says much about the foreign policy objectives of France in recent times. On top of this, reports stress that the Saudi Arabia led coalition is now using cluster bombs in the ongoing bombardment of Yemen. Irrespective of this, and the role of nations like Qatar in Libya and Syria involving the funding of various Takfiri Islamist sectarian groups, France is closing its eyes to this reality. Therefore, while Christians, and other minorities are being cleansed in Syria, the only concern for France is to support feudal Gulf monarchies that are behind this reality alongside other nations like Turkey. The cold approach by France to the reality on the ground in Syria is now being replicated against the Shia Houthis in Yemen. If Hollande really believes that Iran is the real threat, then he should open his eyes to the internal terrorist threat in France. After all, the same Takfiri Sunni Islamist mindsets that are beheading and killing Christians and fellow Muslims in Iraq and Syria are also the same forces that seek to kill in France. However, the response of France is too condemn Shia Iran while supporting feudal monarchies like Saudi Arabia and Qatar that are the lungs of Takfiri Islam, sectarianism and various terrorist groups in Syria.